Is Asia facing a new wave of religious extremism? Editor’s note: Maha Hosain Aziz is a professor of politics (adjunct) in NYU's Graduate School of Arts & Sciences, a senior analyst at geopolitical consultancy Wikistrat and advisory board chairwoman of Afghanistan’s first university e-mentoring program (New Silk Road Generation). The views expressed are her own. Asked to name organizations tied to extremism, most people would likely list the usual suspects – Islamist militant groups like al Qaeda and the Taliban. But a spate of recent attacks has highlighted a growing problem that is threatening to destabilize parts of Asia, and it hails from what might seem to many a surprising source – a militant strain of Buddhism. In Sri Lanka, for example, reports surfaced in January that eight Buddhist monks were involved in an attack on two churches in the southern town of Hikkaduwa. Another group, the Buddhist Power Force, is said to have been targeting Muslim minorities, and has pushed to ban headscarves, halal foods and other Muslim businesses. In July 2013, Buddhist mobs reportedly attacked a mosque in the north-central town of Dambulla; in August that year, a mosque was attacked in Colombo, sparking clashes between Buddhists and Muslims that left at least a dozen people injured. Sadly, the response from the Sri Lankan government, distracted as it is by the ongoing fallout since the end of the civil war with the Tamil Tigers, has been muted at best. Meanwhile, since 2012, Myanmar's Buddhist militants have become more aggressive in targeting Muslim minority religious groups, engaging in hate speech, boycotting their businesses, destroying shrines and in a number of cases killing non-Buddhists. Last March, for example, Human Rights Watch noted a “mob of 200 Buddhist nationalists torched a Muslim school in Meiktila, Myanmar.” It added that students were clubbed and set on fire in the attack, which claimed the lives of 32 students and four teachers. In January, the United Nations reported that at least 40 Rohingya Muslim men, women and children were killed in Rakhine as Buddhist-led rioters burned down Muslim-owned houses and shops. Thankfully, the response from Myanmar’s government was more vigorous than that of Sri Lanka’s, and the government imposed a state of emergency at certain points. In addition, President Thein Sein publicly expressed his “concern” over Buddhist-led protests against Muslim speakers at a local literary event. Unfortunately, this stance risks being undermined by claims in February that the government has been complicit in restricting “basic freedoms” of Rohingya Muslims in Rakhine State. NGO Fortify Rights said in a recent report that documents it had obtained in Myanmar “detail restrictions on movement, marriage, childbirth, home repairs and construction of houses of worship, and other aspects of everyday life”. 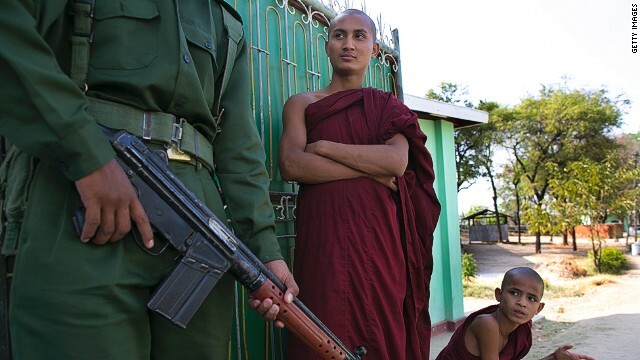 It added that: “Confidential enforcement guidelines empower security forces to use abusive methods to implement these ‘population control’ measures.” And just this week, the U.S. Department of State warned of "the continued lack of adequate security forces and rule of law on the ground in Sittwe," the capital of the western state of Rakhine, following reports of Buddhist mobs attacking foreign aid groups in the region. True, Buddhist-led violence is not unique to the past few years – think of the militant Buddhist movement that engaged in anti-government mob violence in South Vietnam in 1963-65. And in some cases, violent acts could be seen simply as a sign of pure desperation – earlier this month in China, a former Buddhist monk set himself alight in Sichuan Province in protest against Chinese rule in Tibet, the 129th such self-immolation since 2009. But attacks on schools and mob violence against Muslim bystanders suggest a new and combustible ingredient is being added to an already volatile and tense part of the world. How should such extremism be tackled? This is shortsighted, because the reality is that growing Buddhist militancy will only weaken already strained relations between different communities within these countries, threatening to undermine democratic and economic development in the process. But a potentially bigger and destabilizing problem exists down the road – Muslim extremists from outside the region getting drawn into a conflict with Buddhist extremists. In the past two years, Islamist militant groups from Indonesia, Pakistan and Afghanistan have publicly noted the plight of their Muslim counterparts in Myanmar and promised jihad against Myanmar’s Buddhist population. Sri Lanka might find itself not far behind. Will the future of extremism be a battle between Islamist and Buddhist militants? Right now, as the world’s attention is focused on the rehashing of Cold War-style tensions in Ukraine, the possibility seems remote. But the seeds for an extremist conflict in parts of Asia have already been planted. If governments in the region want to ensure long term stability, they would do well to take seriously the growing tensions within their own borders. I was honored to obtain a call from my friend as he found out the important ideas shared on your own site. Studying your blog posting is a real great experience. Thanks again for taking into consideration readers just like me, and I hope for you the best of success for a professional in this area.